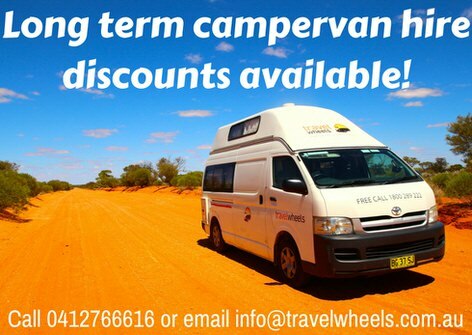 Long Term Campervan Hire Australia Discounts! If you are looking for long term campervan hire discount for a big trip around Australia, then Travelwheels is a good place to get a quote! We own our campervan rental fleet and are not an online reseller! Therefore you deal directly with us (no middle men involved!) we can offer you big discounts on long term hire. Call our team on 0412766616 or email [email protected] for more details. Save up to 30% on Long Term Campervan Hire!! 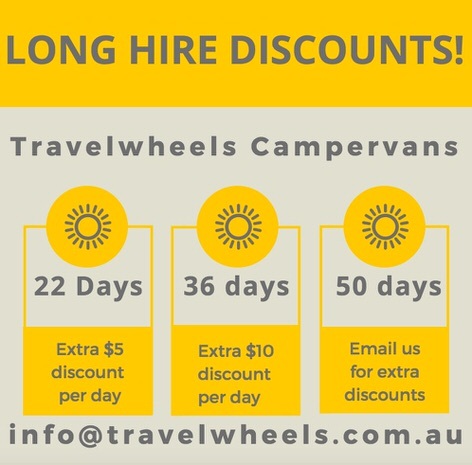 Travelwheels campervan hire Sydney head office can offer savings of up to 30% off long term campervan hire in Australia. If you are in the market for a long term campervan rental, then now is the time to take action! Call our team on 0412766616 or email us at [email protected]. Alternatively you can pop by our Sydney Campervan Hire branch and talk to one of our team. Here are our top 3 deals for long term campervan hire in Australia that our customers have benefited from in the past. We don’t like to over complicate things and make it confusing for anybody wanting a good deal on long term campervan rental deals. To summarise, discounted deals on long term campervan hire kick in after 22 days! If you are thinking of booking a campervan holiday in Australia with us for over 22 days, then you are in luck! You will automatically qualify for an extra discount of $5 off per day from our standard rates. 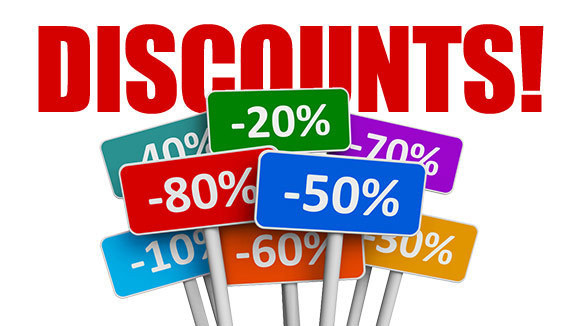 This discount is automatically deducted on our online booking system. Are you after more discounted deals? Book for 36 days or more and travelwheels will automatically deduct $10 off per day regardless if it is peak or low season! 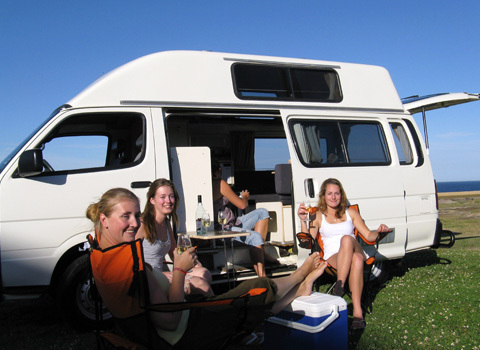 If your campervan hire holiday is more than 50 days, then please contact our long term campervan hire team in Sydney. They can then make a dedicated quote for you and give you tips on how to get a great deal on campervan hire across Australia. Send us an email below with your dates and we will do our best to get your a great campervan rental deal for you. Questions about long term campervan hire to get cheap deals? Can we include Additional Drivers on long term deals? With our long term hires, you can add additional drivers for free over the age of 21 years! No extra charges from Travelwheels! Some of our competitors charge an “Extra Driver Fees”, ouch! As an example these extra fees can range from about an extra $3 per day per person! Is there a minimum rental period for long term campervan hire? To qualify for long term discounts, your campervan hire holiday must be for 22 days or more. We do offer some short hire specials and especially our Brisbane to Sydney Campervan Hire route. Automatic or Manual Transmission campervans? Travelwheels Campervans have a range of vehicles. Most of them are manual campervans, however we do have our 5 Person Automatic Campervan. This has has automatic transmission and it’s very comfortable camper and great for long term campervan hire. Are Multi-Hire long term Campervan hire Discounts available? One Way Hire – can I pick up and drop off in different locations? As we own our camper hire depots across Australia, you can do long term campervan hire with a different pick up and drop off city with us. You get an extra discount when hiring for over 22 days. We will then knock off the one way fee (except over peak seasons such as Christmas, New Year and Easter)! If you go for 36 days or more, then guaranteed no one way fees on all campervan hire booking with travelwheels. Reverse your trip for big long term campervan hire discount! Are you looking for a super cheap deal, and are flexible with your dates? The travelwheels ‘beat the crowd deals’ might be of interest to you! For example Sydney to Cairns is the most popular campervan hire trip in Australia. If you are flexible with dates, pick up, drop off locations and can reverse your trip you can get extra discounts! All long term campervan hire deals starting from Cairns to Sydney get extra discount and the price will be cheaper! Travelwheels operates a ‘fairness policy’ regarding unlimited kms’ and ‘East Coast of Australia” travel only. On all our long term campervan hire deals we offer unlimited kms, with the restriction of travelling along the East Coast of Australia only. This means you can travel as far north as Cooktown which is approximately 327kms north of Cairns. This is where the sealed roads end and then it’s 4×4 tracks only! You can travel as far south as Port Augusta in South Australia. We are an East Coast of Australia Campervan Hire company, therefore we restrict our campervans from the outback, Western Australia, Northern Territory and places such as Ayres Rock. It’s not just the price you have to consider when thinking about long term campervan hire holiday in Australia. Here are some more tips from our friendly staff members at our Sydney Campervan Hire Branch. Australia has a very complicated and confusing toll road system in place! It catches out main of our campervan hire customer! 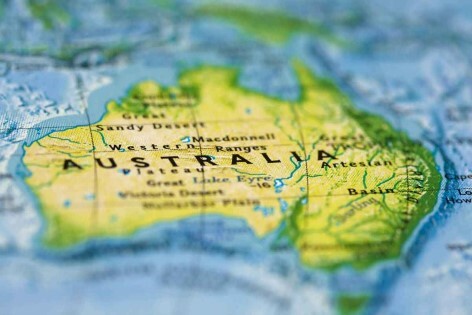 Have a read of our page about toll roads in Australia for travellers on campervan hire holidays. It has lots of tips to help you away from the penalty fines and not give the government you hard earned money! Here is a useful link to the AAA (Australian Automobile Association) giving you a guide to petrol prices in Australia. This is worth having a look and will help you work out how much fuel will it cost for your campervan holiday in Australia. Stop, Revive, & Survive Driving Campaign in Australia. The government and travelwheels recommends that you only drive for up to two hours at a time, taking regular stops. With our free extra drivers you can share the driving with travelwheels! Keep an eye out for driver reviver sites that operate across the country! On bank or national holidays they sometimes offer free tea/coffee and biscuits, so definitely worth stopping! Do you need to pre-book a camping site? Most of the year, you will be ok for camping sites. In the meanwhile if you are travelling in the school holidays or over a public holiday you may need to consider booking a camping spot in advance to avoid being turned away! 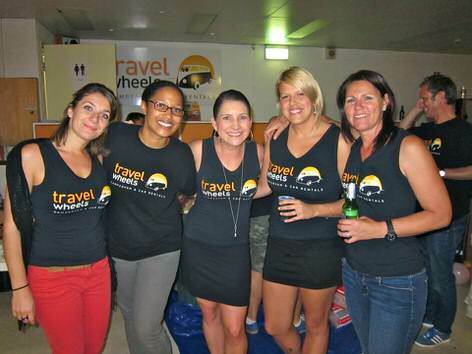 Travelwheels campervan hire staff have travelled all over Australia by campervan. We know what it is like to take a big trip around Australia. We would love to help you plan your trip with us! You can contact us in English, Deutsch or Français for helpful advice on long term Campervan hire Australia deals.